Project obstacles and solutions: The St. Francis Franciscan Health Network operates two hospitals and a number of outpatient healthcare centers in the Indianapolis area. They had experienced problems with floor coverings delaminating and coming detached when placed over new concrete slabs. This was caused when the water-based adhesive broke down from moisture escaping the surface of the concrete slab. This precipitated the shut down of these operations to remove the flooring and mitigate the moisture problem. Tonn and Blank Construction handles all the construction projects for St Francis Franciscan Health and was looking for a solution to this problem. IMI suggested they use Aridus Rapid Drying Concrete to avoid any mitigation issues. Aridus concrete dries out internally and equally throughout the slab. After pouring a linear accelerator pad and measuring the relative humidity (R/H), Tonn and Blank agreed to use Aridus on the new Franciscan Physicians Network Physical Therapy Facility in Greenwood, Indiana. The facility encompassed 10,500 square feet. The concrete was placed at 4 inches and contained a 3/4 inch polypropylene fiber. IMI placed R/H probes in the concrete throughout the facility and also in control slabs that were taken back to their lab. The control slabs were kept in a climate controlled environment (72 degrees F at 60 percent R/H). Since the pour happened in the middle of the winter, the ambient humidity at the job site varied. The facility was completely enclosed, but required outside air venting when gas-powered machinery was in use, so the R/H fluctuated. The average temperature of the facility was 60 degrees F throughout the curing process. IMI monitored the R/H of the test and control slabs at 18, 25, 35 and 45 days. The goal was to get a R/H reading of 80 percent or below. Within 25 days, the slabs at the project had a R/H of 84 percent. At 35 days, the test slab at the job site had a RH of 79.9 percent. At 45 days, the R/H was 78 percent (see the chart to the right). 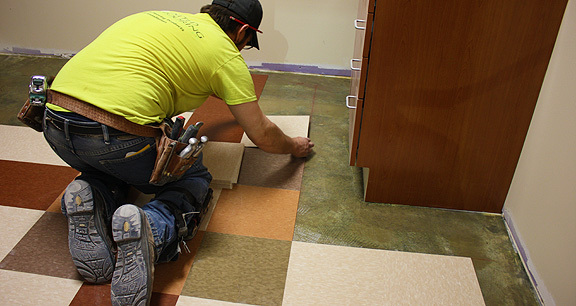 Vinyl tile flooring was laid 77 days after the first concrete was poured. The flooring contractors used a water-based adhesive to bond the tiles to the concrete. As a first step, they filled in saw joints in the slab and skim coated the floor with adhesive. The contractors noted that concrete saw joints normally take a couple hours to dry out so the floors are ready for their final coat of adhesive to adhere the tiles. In this case, the concrete was so dry that the adhesive in the joints were drying out in as little as 20 minutes and were ready for the tiles. IMI also tested the compressive strength of the concrete. Cylinders were broken at 7, 14 and 28 days. The 28 day break measured the strength at 8,080 psi.